The fresh buttermilk biscuit and Jak's signature poached pear, fresh cheese, and pecan omelette trumps a tired old sandwich any day. The Place: I get the feeling there are people out there who consider Jak’s Kitchen their little secret. To them, I apologize. The word is out on this friendly neighbourhood gem (there, I said it) that feeds customers with an uncommonly generous spirit while keeping prices where they should be. Each time I’ve been to Jak’s Kitchen, the food is simple and delicious, which is actually a much bigger compliment than it sounds. The Deal: Jak’s breakfast menu is available every day for lunch, which is perfect for those days when you cannot face the prospect of another sandwich (Is it just me??). While breakfast menus, rarely stray from the predictable script of eggs and French toast, it’s delightful to see that Jak’s riffs on the format, adding a little twist to the standards — for instance a breakfast sandwich has Gruyère and house-made cranberry mustard; a smoked salmon benedict has lemon chive crème fraiche. I’m impressed that Jak’s has maintained its predecessor’s tradition of baking molasses-oat bread in-house. But it’s their original crunchy buttermilk biscuit that has my heart. The Dish: The eponymous “Jak’s” omelette features an envelope of chive speckled free-run eggs (from Beking’s Poultry Farm — they could’ve used cheaper eggs but I am so glad they didn’t! ), filled with a few squishy mounds of homemade fromage blanc, pink jewels of sweet cinammony poached pear, and a handful of toasted pecans folded inside. The sweet-savoury and soft-crunchy contrasts work really well. Golden fried potatoes, a lovely green salad complete with shaved fresh fennel, and that terrific biscuit slathered with strawberry jam round out this satisfying rule-busting weekday brunch. 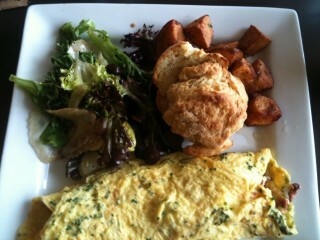 Breakfast menu served 8 a.m. – 3 p.m., Tuesday to Sunday.